The Mmabatho Stadium is situated in Mafikeng, South Africa and is also the fifth largest stadium in the country. Judged by its diamond shape it was meant to be one of the jewels of Southern Africa, especially since its seating capacity is 59,000. Mmabatho Stadium Did It Make The Top Stadium World List? A lot of planning went into the design. The Mmabatho Stadium should have been one of the tourist attractions in the county, a must-see destination for overseas visitors coming to view wild animals. The big question is could it make the world list of impressive stadiums not long after the fifth stadium was upgraded for the 2010 Football World Cup. It became clear that all focus was on its design, while the designers did not pay much attention to usability. The first complaints were that sports enthusiasts got lost trying to find their seats at the Mmabatho Stadium. They could not see their positions due to the confusing layout, which partly was due to the different stadium layout. The diamond-shaped stadium also consists of unique sections, which makes the design even more complicated. Then most of the article in this large stadium wasn’t even centred on looking towards the game thoroughly. Another significant dissatisfaction of the crowd was that anyone in these sections had to turn their heads to see the game. After paying the price of attending a game, the head-turning was annoying to sports fans and most only visited this stadium once as they never enjoyed their time at the Mmabatho stadium. While all hope was on the Mmabatho Stadium appearing on the list of the world’s most beautiful sports stadiums, it looked on the Worlds Strangest Stadiums List. 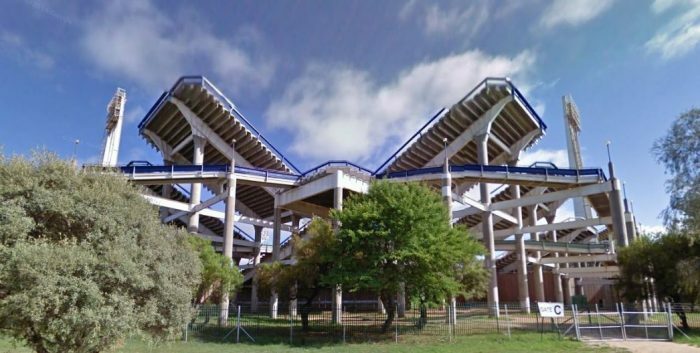 Goldwert described the Mmabatho Stadium as curious and unusual even bizarre and listed it as a hideous monstrosity foisted upon sports fans as a cruel joke. The stadium became known for its unconventional design, unfavoured for its abstract angles and strange geometry. Its seating-layout labelled as odd, with angles that block fans views while it is also far from the pitch. The one thing that became clear was that the designers of the Mmabatho stadium committed a cardinal sin. The rainbow colour scheme combined with angular shapes only added to the circus vibe. The Mmabatho Stadium was built as a sports facility with many, and it is not far from the Botswana border. The stadium design should be perfect for concerts as much as football matches. At the end, the 30-year-old Mmabatho Stadium, even after significant upgrades remained silent during the FIFA World Cup in 2010. It is not used very often, one of the only matches played at the Mmabatho in years is the charity match between the Mamelodi Sundowns and Kaizer Chiefs.